I had already acquired two of Mr. Wescott's3 interesting maps, but it will be none the less pleasant to have one directly from you on that account. The fact that I ordered the map as soon as I saw it at Whale Cove cottage4 will testify to my appreciation of it. Thank you for your kind thought in sending this on. Document is photocopy of one leaf, handwritten on recto only. The year provided by the archivist, presumably written when the letter was photocopied for inclusion in the collection, is the only extant evidence for the year. Westcott, Elizabeth Elwell Craven Wyman (1894-1980). Allan Westcott's wife. Born in Sitka, AK, to John E. Craven and Emily H. Barnard, Elizabeth Elwell Craven married Robert Wyman in 1914; they had two children, Elizabeth and Edith. Some time after 1929 she married Allan Ferguson Westcott; they had one son, Allan Craven. 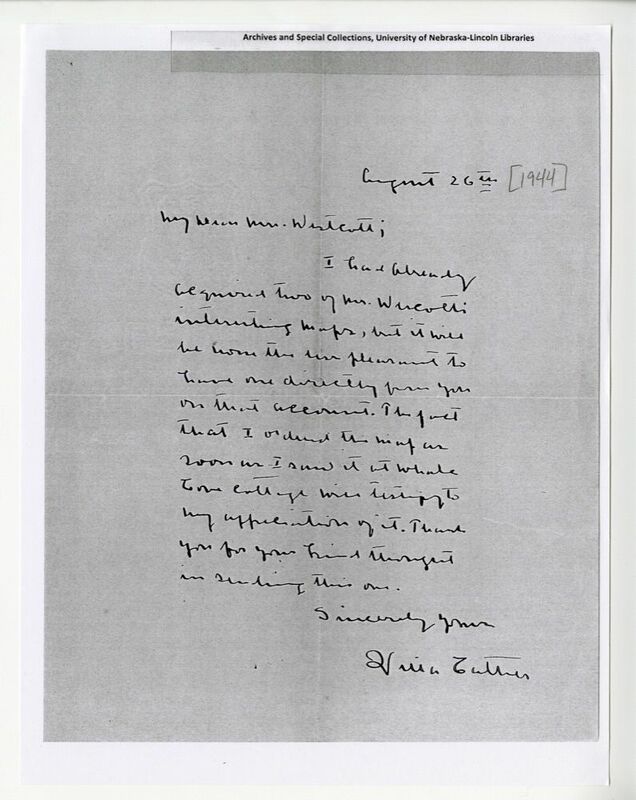 Elizabeth corresponded with Cather, sending her a map produced by Allan Westcott. Westcott, Allan Ferguson. (1882-1953). American historian. Born in Alexandria Bay, NY, Allan Westcott attended Brown and Columbia Universities. He taught at the U.S. Naval Academy, writing and editing several histories of naval operations, including: The United States Navy, a History (1943), American Sea Power Since 1775 (1947) and A History of Sea Power (1948). Westcott married Mary C. Townsend. After her 1929 death he married Elizabeth Craven Wyman Walcott; they had one son, Allan Craven. While Cather researched Sapphira and the Slave Girl (1940), she presumably consulted the maps produced by Wescott for one of his books.